What Diet Foods Do You Eat? When we think of “diet food”, we automatically think of food without flavor. This kills the pleasure of eating. But it is not so! Many of the foods that are stored on the hips and thighs can be substituted. Some substitutes are even tastier than these “calorie bombs”. The difference in calories is significant in this case. We prepared a list of diet foods that can replace many of the hazardous snacks. You will see the “economy” of calories per serving. Water instead of sodas – 100 calories. Mustard instead of mayonnaise – 55 calories. Popcorn made in a hot air machine instead of microwave popcorn with butter – 110 calories. Applesauce instead of Pudding – 110 calories. Frozen low-fat yogurt instead of ice cream – 150 calories. Skim milk instead of whole milk – 60 calories. 2 slices of vegetarian pizza instead of 2 slices of vegetable pizza with mozzarella – 310 calories. Mozzarella cheese instead Ceddar – 140 calories. Tea instead of coffee latte – 120 calories. Cottage cheese instead of Ricotta – 170 calories. Yogurt instead of sour cream (1 cup) – 340 calories. Turkey mince (115g) instead of beef mince (115g) – 130 calories. Salsa instead of guacamole – 50 calories. Baked chips instead of fried chips – 90 calories. It is also recommended to replace margarine or butter with a dash of olive oil. White rice can be replaced with brown rice, quinoa or couscous. Replace fruit yogurt (with a high sugar content) with normal yogurt and you can add fruits or nuts in it. As you can see, these substitutes are not “diet food” in the classic sense. They are a healthier versions of high-calorie snacks. These substitutes can be helpful in a long-term diet. 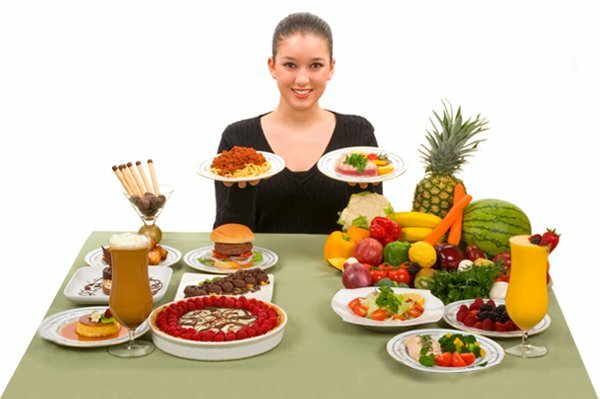 To lose weight and to maintain our health, we should not starve or refuse our favourite foods. We need to be smart and choose this kind of diet food.